Kaitiakitanga - The guardianship and sustainable management of natural, built and cultural resources for the collective benefit of current and future generations. Please embrace this important value and respect The Catlins. In the spirit of manaakitanga, the local community not only takes a hosting role but also has one of guardianship over our beautiful environment. As The Catlins works towards being a sustainable visitor destination, we ask that visitors play their part in contributing to the district’s well-being while enjoying our magnificent natural resources. Find out more about Care for the Catlins. It is not permitted to freedom camp or ‘park up’ in an occupied vehicle overnight in a public place. Persons found freedom camping or occupying a ‘parked up’ vehicle overnight on any Catlins street, reserve, carpark, rest area or road lay-by, will be required to relocate to a designated camping area. 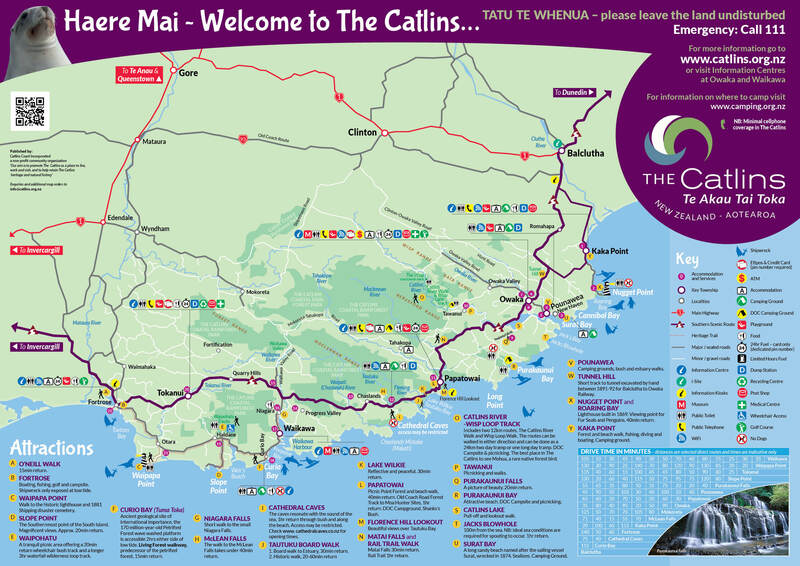 For Information on where to stay in The Catlins go to the Where to stay page. The www.camping.org.nz website is a useful tool for planning motorhome travel in New Zealand. There are helpful tips on how you as a visitor can engage in responsible camping and also links to regional information on camping regulations and motorhome facilities. Please stay in Holiday Parks, Department of Conservation camping grounds or other designated areas. Take a look at the Camping our Way brochure. The Catlins is situated in the Clutha District and Southland District and there are two different Freedom Camping Policies. You can take a look at Freedom Camping Policies for both Southland District Council and Clutha District Council for more information.